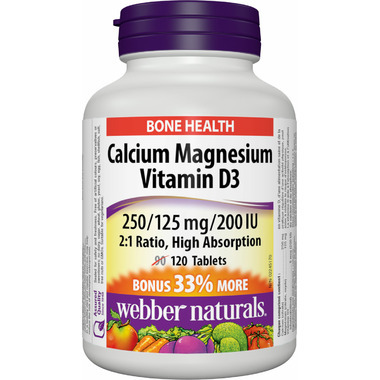 Calcium Magnesium Citrate with Vitamin D (250/125 mg/200 IU) from webber naturals helps form and maintain strong bones and teeth. Magnesium works closely with calcium to help build bones, conduct nerve impulses, and contract muscles. Vitamin D is key to increased absorption of key bone-building minerals. Webber is the brand recommended above all others from my Naturopath. So I recommend it also. Great product, Webber is always good quality. Once again, Webber is the best brand recommended by my naturopath.